You got several options here what should happen if the file rescue finished. This is helpful if you have many different medias to rescue files from and don't want to sit on the PC looking for the progress all the time. 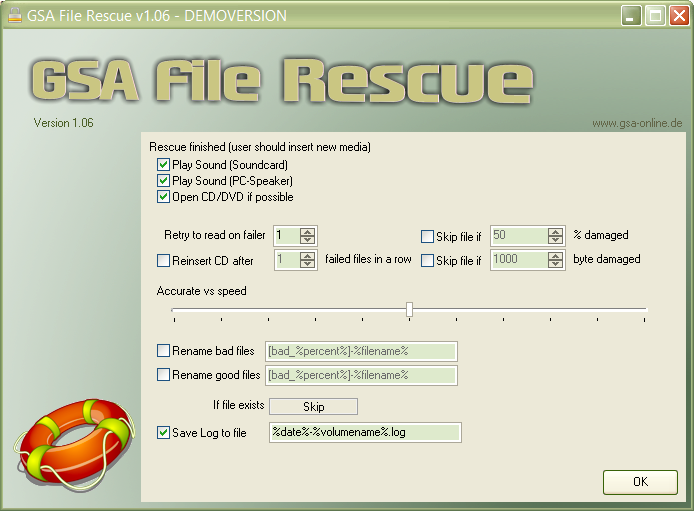 When the rescue finished you get notified by sound and the CD/DVD drive opens if you want to. Useful if your Monitor or Boxes are on so that you hear a signal. Useful if you have no Soundcard at all or don't have the Monitor on. In case you rescue files from optical media it is helpful to see the drive getting opened when all is done so you can simply insert a new media and close it to continue automatically. If an error occurred while reading data, it is tried to redo the step for the number of entered times. This might sound weired but it actually helps sometimes to just reinsert the media and retry to read since the CD/DVD might lay a bit different in the drive. It makes sense to turn this option on and set it to e.g. 50% as a file with more than the entered percentage of damaged bytes makes no sense to rescue. Same as above but based on bytes and no percentage. This is reading files in bigger blocks when speed (right) is preferred over accuracy (left). Please don't change this if not really necessary. In case the file could not be rescued, it is renamed to the thing you can enter here. Usually this makes only sense for bad files to not mix them with good once. Change this to the setting you prefer in case a file is already in the folder where it should be saved to. This saves a log file of the rescue. New log entries are appended in case that file already exists.